Diet is an integral part of your Complementary and Integrative treatment programme. 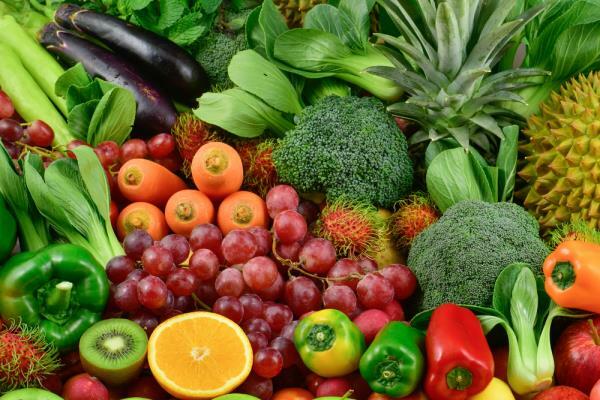 And CANCERactive recommends the Rainbow Diet which is a Lifestyle diet - It is far more than a diet about whole carbs, good fat, colourful vegetables and fruit, fish, nuts and seeds and so on. It is about sunshine (vitamin D), red wine, exercise, keeping on the move, family and more. The American Cancer Society wanted to know if their recommendations on Diet and Exercise actually delivered, so they followed Grade 3 Colorectal Cancer patients (all of whom had had surgery and chemo) for 7 years in research. Those who followed the Diet and Exercise programme (remarkably similar to CANCERactives) had a 33% increase in survival times and 42% less death in the seven years over the people who didnt. We dont know any orthodox therapy that can deliver those sorts of results. The World Health Organisation has stated in various reports that 30 to 70 per cent of all cancers are a result of poor diet. if poor diet can be a cause, could a good diet not be corrective? According to the American Cancer Society again the answer is definitely Yes. In their 2012 report on research into complementary therapies, they talk of an explosion in research into complementary therapies since 2006 and overwhelming evidence that diet, exercise and weight control can increase survival times and even prevent a cancer returning. The top cancer body in America, the National Cancer Institute, has endorsed this report. So clearly good diet can be expected to play a significant complementary role in your treatment programme. The issue, then, is which diet? Lets just spend a moment looking at a little-talked-about diet phenomenon - the French Paradox. This details that the French eat more fat and consume more alcohol than any other nation, yet have less cancer and less heart disease. The epicentre of this phenomenon, according to a second research study by a French newspaper group and undertaken only inside France, lies near Toulouse in foie gras countryside where they eat even more fat and consume even more alcohol and have even less heart disease and cancer. Why? The simple answer is that they do eat a lot of fat but this includes no dangerous trans fat, (hydrogenated vegetable oils - the stuff of junk food) and while there is a reasonable consumption of saturated animal fat, there is also a high consumption of unsaturated fat like olive oil, nut oils like walnut, and nuts and seeds generally. This means the residents have a high ratio of good cholesterol (HDL) to so-called bad cholesterol (LDL) in their bodies. Go to: Links between Saturated fat and cancer. Importantly the locals eat a vast array of fruit and vegetables - all brightly coloured, fresh, local and in-season; the pigments are often the bioactive natural compounds, which are both PROTECTIVE and CORRECTIVE. Did we say corrective? Yes, indeed. This is shown by the explosion in studies within the science of Epigenetics. Put simply, when people get into trouble with diseases like cancer, their core DNA is not mutated (a mutation is a sequence change inside the DNA) but blocked on the outside by the build up of histones. These are held in place by constantly moving methyl bonds. But the science of Epigenetics shows that certain food compounds can clear the methylation and histone build up and thus the blockages; while others can cause surrounding genes to express proteins that compensate for certain shortfalls. The Bottom line. You are not doomed! The fact is that there are many bioactive natural compounds in the Rainbow Diet possessing Epigenetic benefits - not just the colourful fruits and vegetables but fish and olive oil and even vitamin D.
- Red wine active ingredients like resveratrol and OPCs from grape seeds can all play an enormous role. Resveratrol has been shown to inhibit the re-growth of cancer stem cells (Click Here) - in the American VITAL study, grape seed extract was 46% ahead of any other common supplement in anti-oxidant power. Find out more about the crucial importance of having a healthy gut by Clicking Here. Now, you may have read about research studies in the newspapers on the colourful and healthy Mediterranean Diet - The Rainbow Diet. Then theres the high fat, lowish protein, low carbohydrate, nil sugar Ketogenic Diet - its an extreme Rainbow Diet. Then theres the Paleo Diet - soooo complicated - and quite simply not true according to paleontologists. They didnt eat tubers - they did; they didnt eat gluten - they did; they didnt eat lactose - they did. The simple lifestyle diet you need to understand is the Rainbow Diet. Therell be another diet along soon. The point is that there is now a huge build up of research to support the colourful Mediterranean Diet and its benefits with cancer, diabetes, Alzheimers, dementia, longevity, bone strength etc. And there is little or no research behind some of these other diets - which is how this whole book started. We wanted a Lifestyle diet that included not just food, but other elements that could protect and correct; elements that could build a new You. And, with so much research to support it, we think we have chosen well.